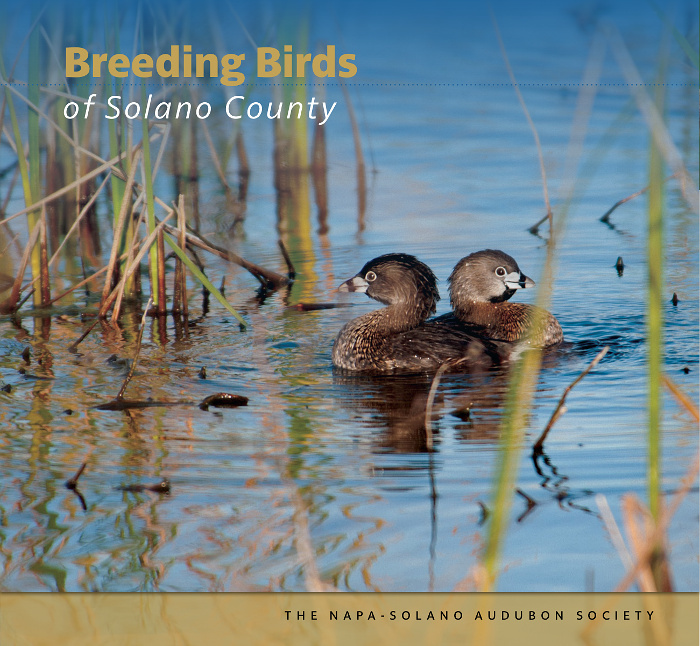 Napa-Solano Audubon is excited to announce the SECOND EDITION of the Breeding Birds of Solano County. After more than six years of preparation and extensive field work, this book is the culmination of our Solano Breeding Bird Atlas project and the definitive resource on the nesting birds of Solano County. Much more than just a landmark scientific publication, this is a true work of art: A hard cover book with the finest possible paper and materials, a professional layout and design, and hundreds of high-quality color photos. The second edition is 1 inch smaller in both width and height (12" wide by 11" tall), and includes the latest taxonomy and conservation status updates, modifications, and some minor corrections. The book is now available for ordering online or pick-up at one of our events. The first edition sold out quickly, so order yours soon! Click here for more details including sample pages and photos of the hard cover book. Also click here to open our 1-page flyer with additional details. The book begins with a carefully researched and illustrated section on the geography and habitat types within Solano County. This is followed by a larger section describing all the nesting bird species. One page is dedicated to each species, with a detailed county map showing breeding locations, interpretive text, and beautiful original color photographs by local photographers. Click here to read some early reviews. In addition to the hard cover edition, the book is available as an interactive eBook with additional features. The eBook includes bird songs! On each species page, you can click to hear an example of the bird's song or call. The eBook also has many extra pages including a summary of the results for each "block" or part of the county. The format of the eBook is the latest new "fixed layout" style that preserves the exact same layout and design as the hard cover book. It is best viewed on a larger tablet device rather than a smart phone. The book is available as either an EPUB file that should work on any non-Kindle tablet, or as a PDF file that should work on any tablet or e-reader. Click here to open a .pdf "Frequently Asked Questions" sheet with more information about the eBook. The price of the hard copy book is $55 which includes sales tax. If you live near Solano County, there will be many opportunities to buy the book in person at our monthly meetings and other events. If you order from this web page, the book will be shipped to you within two weeks for an additional $10. The eBook price is $30 purchased alone or $15 if purchased in combination with the hard copy book. If you are ordering the eBook only, it is available now and the best way to order it is using the PayPal button below. To order either the printed book, eBook, or both, use the PayPal button below. All of the options for hard cover books include tax, shipping and handling. NOTE: When you click the "Buy Now" button, you will be transferred to the secure PayPal web site, so read the rest of this information first. For PayPal purchases, you do not need a PayPal account. You can make your payment with a credit card. When your transaction is complete, there should be a link to bring you back to this web site, or you may be transferred automatically. You should also receive an automated email confirmation from PayPal. Eventually you should receive a personal email Thank You from us with instructions for how to obtain your eBook if that is part of your purchase. Please be patient; the personal email may take us a day or two. The options in the drop-down picklist above are limited. If you want to order more than 3 hard cover books with shipping, please make multiple separate purchases, or contact us, see below. In addition to the PayPal options above, you can place your order by filling out a form and sending it to us in the mail along with a check. This will take a few days longer than using PayPal, but it saves us the administrative fee that PayPal deducts from the purchase price. If you choose to send us a check, click here to open a form to print. You can mail the form plus your check to Napa Solano Audubon Society, PO Box 10006, Napa CA 94581. 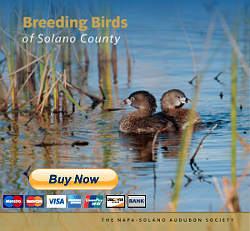 Make your check payable to Napa-Solano Audubon Society. Please allow up to two weeks for shipment. We are a small organization run by volunteers, and upon receiving your order, we will ship the book to you as soon as possible. Contact us. If you have difficulty using the PayPal button above, you may contact the webmaster at this email: webmaster AT napasolanoaudubon DOT com. And if you have any questions or concerns about your purchase, you can email the NSAS Sales committee: sales AT napasolanoaudubon DOT com.